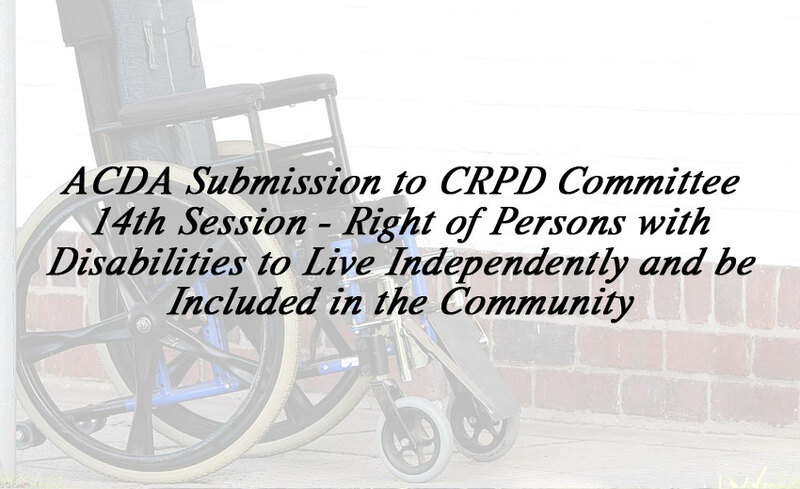 In February 2016 the Australian Cross Disability Alliance (ACDA) made a submission to the Convention on the Rights of People with Disabilities (CRPD) Committee 14th Session ‘Day of General Discussion (DGD) on the right of persons with disabilities to live independently and be included in the community’. Written by Carolyn Frohmader with input from Alliance members, the submission focused on the recent national Senate Inquiry conducted in Australia into ‘Violence, Abuse and Neglect against People with Disability in Institutional and Residential Settings’ – including the gender and age related dimensions, and the particular situation of Aboriginal and Torres Strait Islander people with disability, and culturally and linguistically diverse people with disability. The incarceration of people with disability in institutional and residential settings – where they are exposed to and experience multiple forms of violence – violates a myriad of human rights, including the right of persons with disabilities to live independently and be included in the community (CRPD Article 19). The recent Australian Senate Inquiry and its findings, offered a relevant and timely contribution to the CRPD Committee’s work on Article 19 of the Convention on the Rights of Persons with Disabilities.